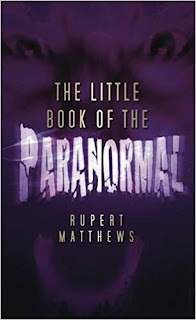 Rupert Matthews' The Little Book of the Paranormal is just that! This under-sized hardback edition only measures in at 5 inches by 8 inches and only contains about 144 pages of information...but for such a small package it packs a hefty punch. This probably isn't a book specifically aimed at the reader who is well-educated on a variety of paranormal topics. Rather, its a great little introduction to the novice student of the paranormal, or for someone who just wants a quick sampling of stories without delving into too much history or analysis. The topics covered in this book range from cryptids to UFOs to ghosts and hauntings. Whatever your niche interest in the paranormal field is, there's sure to be something here to interest you. Historic illustrations help break up the well-written text and serve as visual interest to the information presented. I really enjoy books like this; each story is short, concise, and to the point. It's a quick read that you can put down and pick up again any time without losing any context. It's an entertaining read, and one that has inspired me to do additional research on topics such as the British WWI pilot whose spirit arrived back at his room...at the very moment he died in a plane crash. The Little Book of the Paranormal was included in the pile of books I purchased this year at ScareFest, but you can find both a physical copy and the Kindle edition on Amazon. With such a wide appeal, I think this book would be a great read for anyone with any level of interest in the paranormal.